YS Tech Discusses Cooling Fan Bearing Systems Offered. 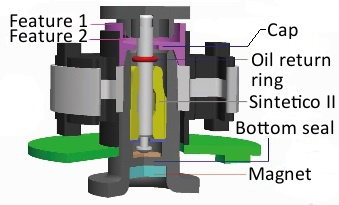 This month we are going into some detail on our Bearing Systems! So, grab your Engineering hats and I promise not to get too carried away. 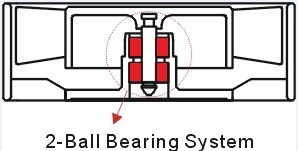 As you know YS Tech USA currently offers three bearings Systems: 2-Ball bearing, Sleeve and the Sintetico II system. Letter designations being: B, S and L respectively. Let’s start with the 2-Ball system. the round areas are the “balls”. If I turned this into a dissertation with much larger graphics you would be able to see the particular shield in this example – but, I promised not to get too carried away! Let’s just say, whatever our Engineers decide is required; NMB will provide the shield type to accomplish the requirements. Briefly: because of the extremely small bearing sizes we use, they have a shield (or shields) only. 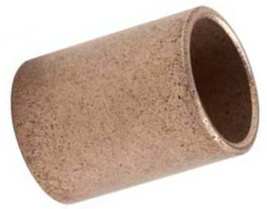 Our bearings are not sealed – they are just too small! I know what you’re thinking, how can just a shield keep out all the crud in the air? Well, it’s because the shield can be designed to take advantage of the fans rotation that actually produces pressure in the area, expelling debris (as one example)! Our Engineers know and understand the environmental demands going into a design and make sure the optimum shield design is utilized in the bearings. This system will provide good service out to 80,000 run-time hours. If you were to, again, take your knife and cut one of our fans in half, here’s what the 2-Ball system would look like – the red areas are the bearings. I think it’s safe to say, even though the 2-Ball system has been around for 50 years, the Sleeve system preceded it in other less demanding applications! There’s something to be said for that. On the other hand … being the oldest technology, as with all older technologies, sooner or later they need up-dated (we’ll talk about that later with the Sintetico II system). The YS Tech sleeve bearing system is composed of Oil-impregnated material (bronze) and intended to be the lowest cost system offered. As mentioned, the technology is well established and is very cost-effective for many applications. But, as you might imagine this system has some requirements if it is to perform as expected. Such as: mounting orientation (the fan needs to be mounted vertically), ambient environment temperature, as well as moisture and/or contaminants. Another attribute which is limited with this low-cost system is longevity. 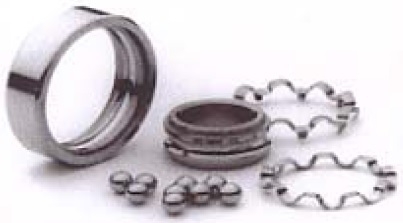 The typical Sleeve bearing MTTF is 25,000 – 30,000 run-time hours. Of course, there are multitudes of applications where these parameters work out just fine. 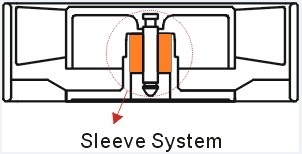 A section of the Sleeve bearing system looks like this – the Orange area is the bearing. 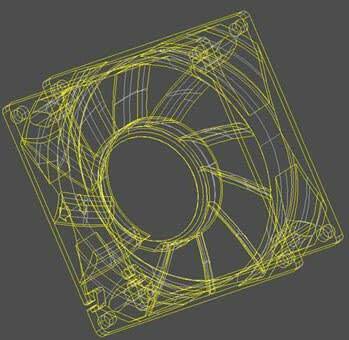 -the dark yellow area is the bearing. not shown here is the magnet. But, Looking at the section drawing you can see the system is quite complex. Now you sales professionals can talk to your Engineers with some level of familiarity and hopefully recommend the most appropriate system while discussing the requirements. Don’t forget to call me if you have questions. I’m happy to fill in any blanks.